The prospects for the British economy in the interwar period could not be called bright. The biggest Empire in the world is only superficially looked unshakable; in fact the problems were coming from all sides. The economic crisis has caused serious reductions in the armed forces, which affected and Navy — Holy of holies “nation of sailors”. The new ships had to develop first of all of the conditions of austerity. But the problem was not limited to the economy. In the years since the beginning of the century, has strongly changed alignment of forces in the world. The last one sometimes becoming a potential enemy — it is obvious to the British was Japan. With the mid 30-ies of the way of both empires broke up; the Anglo-Japanese Alliance broke up, and before Britain ever more clearly looming prospect of war in the far East. The chances of “mistress of the seas” to come out of it a winner looked very doubtful. It became clear that especially hard would the British torpedo forces. Japan series for series build a beautiful destroyers, combat capabilities far superior to the ships of their old teachers. In these circumstances, the question of savings is not going. Required an adequate response by artillery and torpedo craft, not to give their alleged opponents. However, the British still considered themselves to be owners in any situation and continues to considered destroyer how do fighter any torpedo enemy ships. So, by 1935, was born the project “leader V” (in memory of successful ships during the First world war). He looked more than impressive: ten 120-mm guns in two-gun units, with three units could fire directly on the nose and two on the stern. (The location of artillery, later adopted by the air defense cruisers of the “Dido”.) The speed was equal to a standard 36 knots, and a displacement task was not to exceed the contractual 1850 t Place for torpedoes designers had to produce literally centimeters. Offers a variety of options, including exotic platetronic apparatus, three pipes which could shoot in one direction, and the remaining two in another! Moreover, it was required that the gun could fire at aircraft. In General, on paper the project looked too good to be embodied in metal. Real artillery came one and a half times heavier than the project, and their anti-aircraft properties was very limited due to the small elevation angle. But still the English destroyers were the first to introduce at least some elements of mechanization of loading, and the increased rate of fire to 10-12 rounds per minute. Perfect in theory, the scheme of location of artillery led to a too high silhouette. So one of the nasal plants, first wanted to move to the middle of the body, between the tubes, and at the last moment from it all was abandoned in favor of traditional four-barrel 40 mm anti-aircraft “POM-POM”. However, a series of destroyers known as the type “Tribal” (the ships were named after representatives of the wild warlike tribes, and in English the word “tribal” means “tribe”), was one of the most successful in the British Navy. They are often called leaders — mainly due to the limit of contractual capacity, although in reality only two of them were equipped as leaders of divisions. The ships fought in all theatres from the Arctic to the South Atlantic, but with their “special” opponents from Japan, against which they, in fact, built to meet them and failed. During the war it turned out the apparent uselessness of the main fire to fight modern aircraft, so the vast majority of units (14), survived after 1940, aft-replaced by paired mechanized anti-aircraft 102-the graph paper and the number of machines has increased due to the undemanding and lightweight 20-mm “Arlekino”, which replaced the almost useless heavy machine guns. Already during the war, as in “triplow” built their own small series of ships of the British dominions — Australia and Canada. Overall a good ship then criticized supporters of torpedoes, believing it too large, expensive and poorly armed to attack large enemy units. Here, British designers showed that if necessary, they can still quickly create a new great project, and shipbuilders — are almost as fast to put it in the metal. Large destroyer type “Jervis” series (“J”) had perhaps the most balanced performance among all the destroyers of Britain pre-war and wartime buildings. Having only two guns less “tribal”, they were at the same real torpedo ships, carrying ten torpedo tubes. In addition to a good “digital” performances, “Jervis” had the traditional British warships is not very noticeable on paper, but very valuable advantages, in particular, excellent seaworthiness. They perfectly keep the speed on the wave, and the new shape of the hull allowed them to operate in the open ocean in almost any weather. 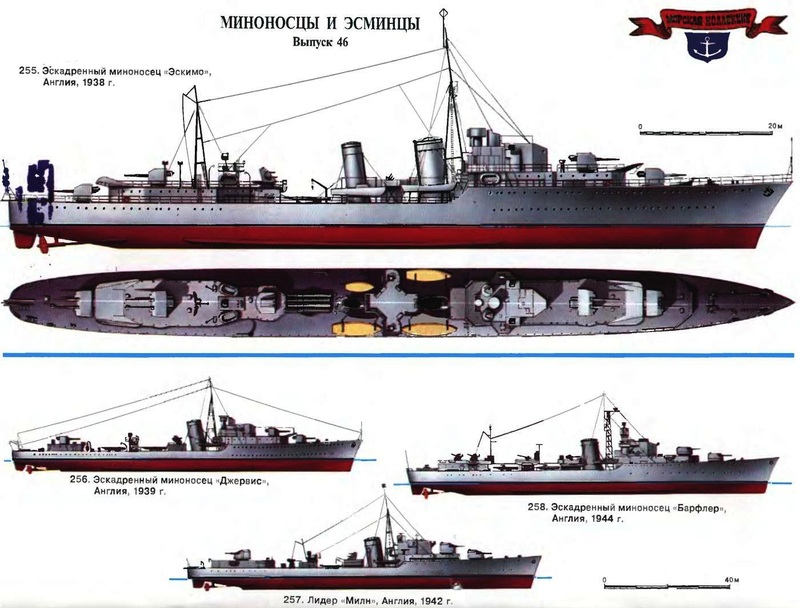 However, the disadvantages of “Jervis” was also traditional: 120-mm artillery remained virtually helpless enemy planes during the war, some of these great destroyers (and all of them were built three boats for eight units — types “J”, “K” and “N”) lost one of the torpedo tubes in favor of dubious acquisition — single 102-mm anti-aircraft guns with local fire control. The past only allowed you to scare off German and Italian aircraft. Not to say that the experts of the Admiralty did not understand the weakness of their defense compounds, which, in principle, was to strengthen the destroyers. In fact, the latter are needed to protect against attacks from the air. Therefore, based on a good “J” before the war was created a project of superesminets type “Laforey” series (“L”). Despite formally still a part of the armament, it possessed a qualitatively new artillery, not inferior to the best foreign samples. Now 120-shot of graph paper 28 kg shells, heavier than the 127-mm guns of the Japanese and the Americans. Twin installation was a very real, fully enclosed turret (although with a very light anti-armor); provided mechanization of pickup and loading, and the gun could be induced separately. And crowned with artillery piece first used a universal command-ranging post (KDP), destined to control the fire at surface and air targets. Belonged to the type “Tribal”, was built by the company “Vickers-Armstrong”. Displacement standard, t 1860, full 2550 T. maximum Length USD 114.9 m, a width of 11.12 m, draft 2,8 m. Capacity twin-shaft turbine installations 44 000 HP, speed 36 knots. Armament: eight 120mm and four 40-mm guns, eight 12.7-mm machine guns, one four 533-mm torpedo tubes. Only in 1938-1939, was built 16 units: “Afridi”, “Ashanti”, “Bedouin”, “Kossak”, “Eskimo”, “Hurka”, “Maori”, “Mason”, “Mata-bele”, “Mohawk”, “Nubian”, “Punjabi”, “Sikh”, “Somalia”, “Tartarus” and “Zulu”. Twelve of them died during the war, and the surviving “Ashanti”, “Eskimo”, “Nubian” and “Tartarus” scrapped in 1948-1949. Belonged to the type “J”, was built by firm “Hawthorne Leslie.” The standard displacement of 1700 tons full 2350 T. the Length of the longest 108,61 m, beam 10.8 m, draft 2.8 m. Capacity twin-shaft turbine installations 40 000 HP, speed 36 knots. 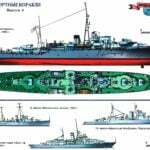 Armament: six 120-mm and four 40-mm guns, eight 12.7-mm machine guns, two torpedo tubes pettrovich. Just 1939-1940 built eight units: “Jersey”, “Jervis”, “Jekel”, “Jaguar”, “Janus”, “Javelin”, “Juno” and “Juliar”. Survived the war only “Jervis” and “Javelin”, scrapped in 1949. It was built by the firm of “Scott.” The standard displacement of 1950 tons full 2690 T. maximum Length 110,5 m, width of 11.21 m, draft 3.05 m Power two shaft turbine installations 48 000 HP, speed 36 knots. Armament: six 120-mm and four 40-mm guns, eight 12.7-mm machine guns, two four 533-mm torpedo tubes. Just 1941-1943 built eight units, series “M” (“Milne”, “Marksman”, “Martin”, “Matchless”, “meteor”, “Musketeer”, “mirmidon” and “Marne”), and eight like-type ships series “L”. “Marksman and Martin” were killed in the fighting, “Milne”, “Matchless”, “meteor” and “Marne” transferred to Turkey in 1957. “Mirmidon” in 1942, transferred to the Polish armed forces in exile. Scrapped in the mid 50-ies as “Musketeer”. Belonged to the type “battle”, built by “Swan hunter”. The standard displacement of 2380 tons, full 3380 t maximum Length of 115.5 m, width 12.2 m, draught 3,9 m. Capacity twin-shaft turbine installation of 50,000 horsepower, speed 35.5 node. 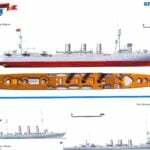 Armament: one 102-mm and four 114-mm guns, eight 40-mm and six 20-mm guns, two four 533-mm torpedo tubes. Only in the years 1944-1946 built 16 units: “Armada”, “Barfleur”, “Cadiz”, “Camperdown”, “Finisterre”, “Ms. Gabbard”, “Gravlin”, “Hogue”, “Lagos”, “Saint James”, “Saint Kitts”, “Saints”, “Sluis” and “Vigo”. Theoretically, the ships of the “L” was supposed to be the best in their class, but in practice, alas, it was much more difficult. The debut creation of a universal artillery for the destroyers did not triumph affected by the lack of the designers experience in this field. The speed of horizontal and vertical guidance guns and KDP did not allow “news” high-speed aircraft, the installation of remote pipes and feed shells also left much to be desired. In an attempt to rectify the situation on the part of the destroyers of “L” series instead of 120 mm, placed three twin installation 102-mm anti-aircraft guns, turning potential leaders in the defense ships, but to a noticeable extent devalued them to the artillery battle. His two series of eight pieces, the British were forced to abandon the further construction of these large and expensive ships. And even offered to rebuild the second series (“M”) in the standard “Jervis”, but candidates for restructuring were already in a too high degree of readiness, and their conversion refused. The war started poorly for Britain, mixed all further plans. Heavy losses in ships forced the Admiralty to improvise. Since the new destroyers were required “here and now”, had to compromise, as usual, is not always successful. As the basis for “extraordinary” series took the project “J” with its seaworthy hull and reliable mechanical installation — the solution, in General, quite reasonable. But with guns the new ships are not lucky plants could not cope with the orders, and diversity of options of armament of destroyers following episodes as in a mirror reflected all the difficulties of industry in wartime. A promising proposal — to equip them with four 102-mm anti-aircraft Sparky was not for lack of guns and the apparent overloading of ships. Eight units of the first and second “emergency” series (the”O” and “P”) received one of four who five 102-mm single guns (excess — at the expense of one of the four torpedo tubes). Following the destroyers, from “Q” to “W” (only seven “letters” to eight ships), armed with four 120-mm guns, the only advantages which were simple operation and manufacturability in production. At that time, as in other navies went or tried to go towards the creation of more sophisticated guns, the British sailors had, like 30 years ago, manually feeding the shells and aim at the eye of the enemy cruisers and battleships. However, ironically, this old-fashioned ship of the series “V” made one of the few classic torpedo attacks, sinking freely manevrirovali Japanese heavy cruiser “Haguro” had moreover, though not too advanced in design, but it is a workable radar. Only by 1942 the British had finally managed to create quite a modern instrument new, 114-mm caliber, 25-pound shell is not inferior to the famous American 127-graph paper. Provided and mechanization of loading. However, the problem with installations for new guns remained as sharp — had neither the time nor the resources to develop fundamentally new models. Had to finish the old “alphabet” (eight pieces of type “Z”) version of the same “emergency” series (the only change is the caliber of the guns). And new, begin with the letter “C” (four flotilla, 32 units) fully repeated the same military project with single plants, are practically not suitable for combat aircraft. Only at the very end of 1942 on the drawing boards there was a project of the destroyer, to fully charge a modern level. We are talking about the type of “battle” (from “battle” — “battle”), all units which were named in honor of battles won (or at least not lost) by the English Navy or army. On the new ships was set at three twin 114-mm artillery systems — finally fully enclosed and mechanized, with great elevation and universal fire control system with radar artillery. Main battery was complemented quite perfect 40-mm anti-aircraft machine guns. However, it was necessary to refuse from at least one of the two four torpedo tubes. The last condition of that time it seemed reasonable to everyone, but not fighting the British admirals. As a result, instead of a third unit ships received a 102-mm shortened gun, suitable only for firing illuminating shells or shooting targets in point blank range. In the end, again turned the ship “intermediate” sample, which could not be considered as the basis of a large series. In 1943, the project “battle” altered, replacing the useless 102-mm gun on the fifth 114-graph paper — also half-hearted, but a much more logical decision. Immediately followed the order for three flotillas of destroyers (24 units), which demonstrated the weakness of the once great Britain. The end of the war found most of the ships on the stocks, and many of them were in a considerable degree of readiness. However, in a system introduced only six units — despite the fact that numerous “emergency” destroyer already needed replacing on modern destroyers. The rest stood at the outfitting of the wall who two, and who for six years, but in the end it went to be scrapped. Financial difficulties of post-war England was more severe than during the great depression. The sunset the greatness of the former “mistress of the seas” as a sea power entered the final phase.